As blogged before I booked some time off from duties @ home on Saturday (afternoon, evening) and Sunday (morning), allowing me to basically be on the air on all parts of the day. On both days I worked mainly using my hexbeam at about 36-40ft. On Saturday I changed the antenna once (to my 4 element yagi for 10m) to try and work RI1ANU on 10m. 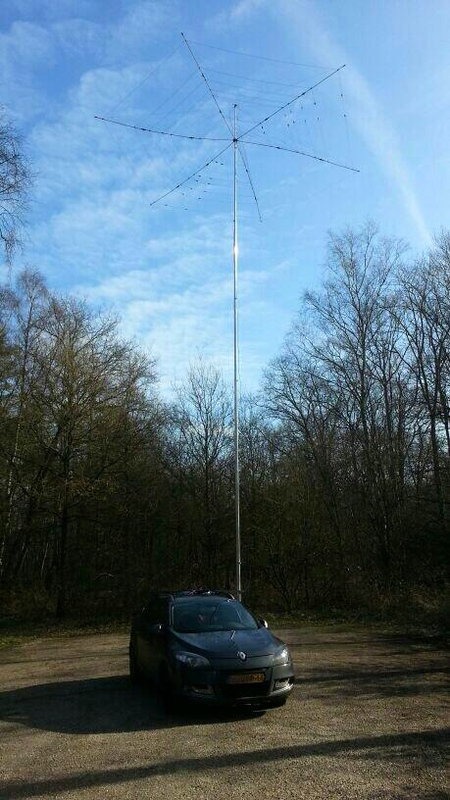 By the time I changed the antenna though RI1ANU was gone.. 1 hour completely lost. Luckily I managed to log RI1ANU in the evening on 20m. On Saturday the wind was just a bit too strong for the mast height I chose (extending all parts to a height of 40ft), resulting in a strong bend. This was not noticeable in the results however as I managed to work almost all stations I wanted to work. 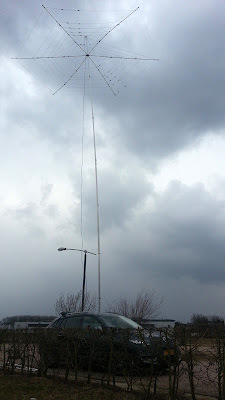 On Sunday I extended all but the last part and guyed the mast in the direction of the wind (see picture below). 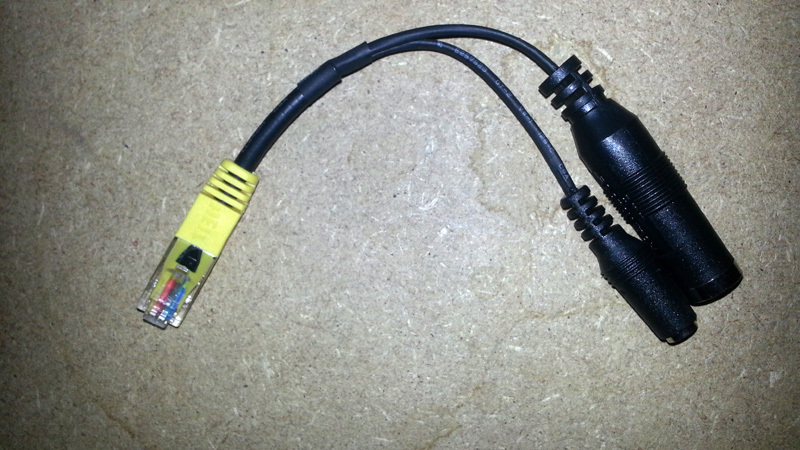 This worked very well and kept the antenna nicely parallel to the ground. On Saturday I started at 14h local time. I hopped around over the bands using the DX cluster on my phone and the occasional hints from PD7YY via Whatsapp. I logged 60 contacts in about 5,5 hours actually spent behind the radio. During a flora and fauna activity that would take about half an hour but looking for specific stations only, the logging speed is "slightly" lower. I logged 9 new DXCCs and 14 "new band DXCCs". With the change to summer time there was one hour of sleep less to get. I decided not to extend my Saturday evening hunting for some new DXCCs on 40m (there were some) but to get up in time so as to pick up the signals from VK and ZL in the morning. On Sunday I was operational again at 9 am local summer time and stayed on the air for less than three hours. I logged only 17 contacts this time, including 1 new DXCC and 8 "new band DXCCs". 10m was mostly dead (probably still too early) and 15m not too strong. As I expected Oceania was reachable - strong on 20m - and I added ZL as a new band contact on 20m, as well as working almost all VK regions (with VK1 and VK7 being new ones for me). I started working short path - not being familiar with beams just yet. So I had some trouble working Paul VK5PAS, who I worked before and who was not particularly strong. Only after I worked him it dawned upon me that conditions were probably better long path. This was indeed the case and soon after I added the other VKs and ZL to my log. Noteworthy was VK7ZX who was a steady 9+10dB in my humble station. All in all I worked 10 new DXCCs (3DA, 5R8, 5Z, D3, DU, FH, FR, KL, RI1ANU and 4U1ITU) and 22 new band DXCCs. Most new ones were in Africa (6). There were only a few stations I missed due to changing conditions or lack of time (or because they simply could not be copied through the QRM). The outcome of my operation this weekend can be seen on the map below. Dots are "regular" contacts, stars are "new band DXCC" contacts and the larger place marks indicate new DXCCs worked. Yellow indicates 20m, orange 15m, red 10m and purple 17m (contacts outside of the contest). Last Wednesday conditions for a /P operation were good: not too much to do around the house and good weather. So when I got the kids in school I collected and loaded all my /P stuff in my car to drive to my favourite low profile /P location just north of Arnhem. It has been a long time since we had weather like we had on Wednesday. It was 16 degrees Celsius and standing in the sun I did not need to wear a jacket to stay comfortably warm. Quite a change from the last time I was out and almost froze my feet from standing outside in the cold for 1,5 hours. The hexbeam needed a bit of time to unfold as the wires got a bit entangled but once unfolded all wires were still in place and kept the spreaders in the right shape (thanks to the tape I placed on the spreaders). Due to the extra time spent on the beam it took me about 45 minutes to get the station installed. 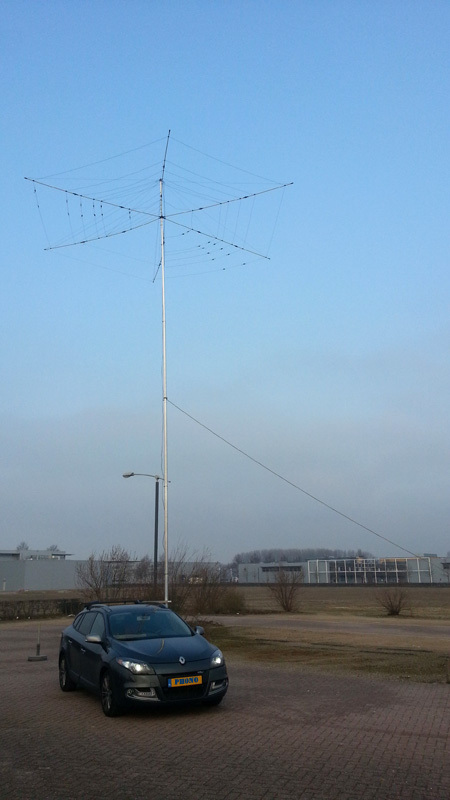 I started out calling CQ on 15m. There I was greeted by OMs from TA and JA. Apart from those OMs it remained rather quiet. Then Marcel PD7YY (my human DX cluster) sent me a Whatsapp message to inform me about a DXpedition @ XT. 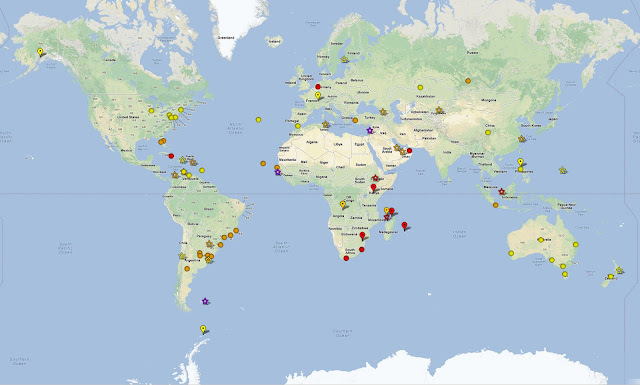 At that moment they were active on 12m CW (so they had not appeared on my phone's DX cluster app as I filter on phone only) but not much later they appeared on 17m. First they focused on JA long path but half an hour later I was in their log. In the mean time I came across two other interesting DX stations: 3B9 on 12m and Z81 on 10m. Z81 was working by number but I did not get through on the first and rather short "0" slot. The 3B9 DXpedition was working JA exclusively every time I came back to their frequency. I kept going back and forth making a contact with JX on 15m in the mean time (new band). The next time Z81 came back to "0" I was ready and managed to get through after two or three calls. Another new one. FT-857, Heil head set, LiFePo batteries and paper log - not on the picture is my mobile amp + car batt. 3B9 was still focussing on JA and Asia, so time to look around for other DX. Then ET3AA appeared on 15m. I must say that having an all band antenna really is brilliant - nothing else to do then just change the frequency on the radio and I am set to go (keep in mind I am used to work with EFHW antennas where I have to change the wire to change bands). After some calling I was in the log of ET3AA as well. Time was running out and 3B9 was no where to be found any more. I did see XT spots on 20m. So I gave that a try and was in their log on this band as well without much trouble. Then it was time to break up the /P station to be back at school in time to pick up the kids. Timing this I found it takes me just under half an hour to get everything nicely packed & in the car. All in all a very nice /P morning. Perfect weather, three new DXCCs and two new band DXCCs.